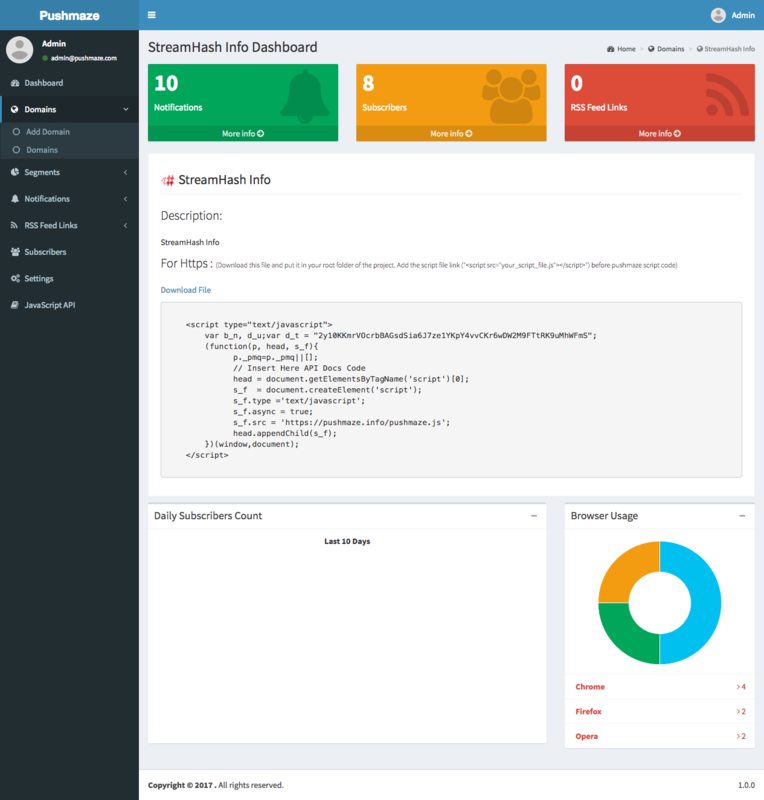 Dashboard – You can see the following details. 1. How many domains added in pushmaze? 2. How many notification has been sent till now? 4. 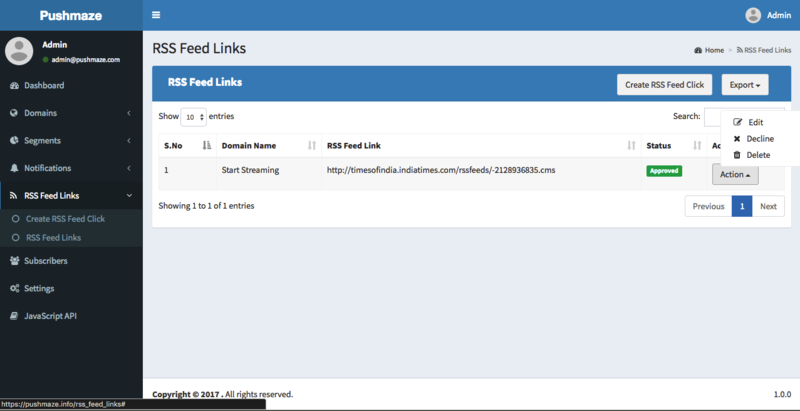 How many RSS feeds link added? 5. In graph you can see last 10 days subscribers count. 6. Browser usage – How many chrome, firefox and opera users subscribed? Domains – Here you can see list of all domains with basic details like, domain name, url,logo, and status. And the you can export the domains in CSV, excel or pdf. By clicking the export button. In action button – you can do the following actions. 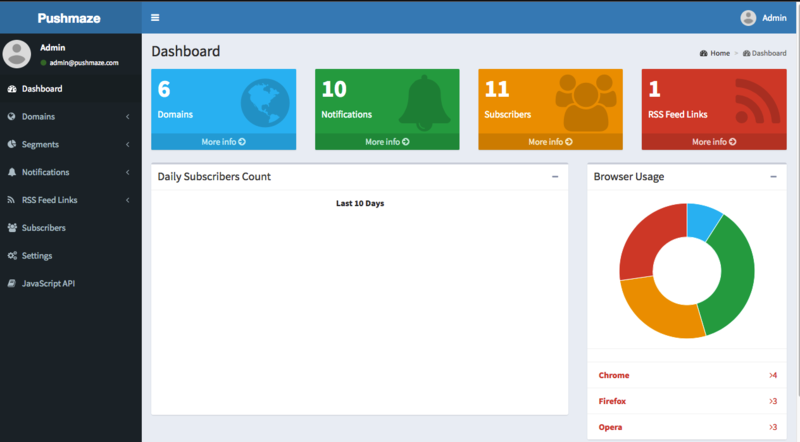 Dashboard – You can see the entire history for this domain. 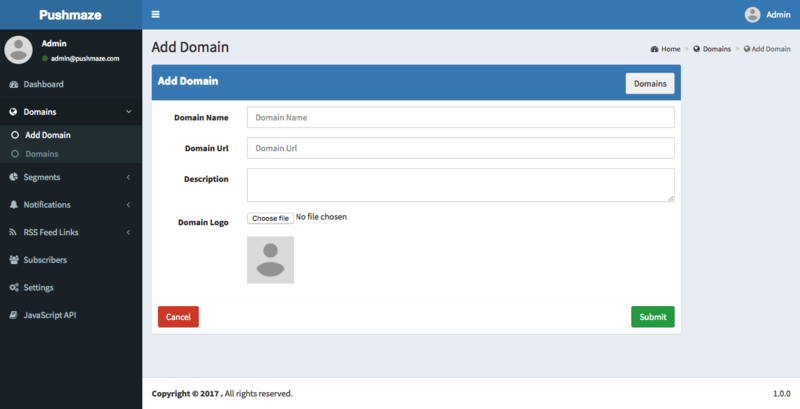 Edit – Edit your domain details. Decline – you can decline or approve the domain. 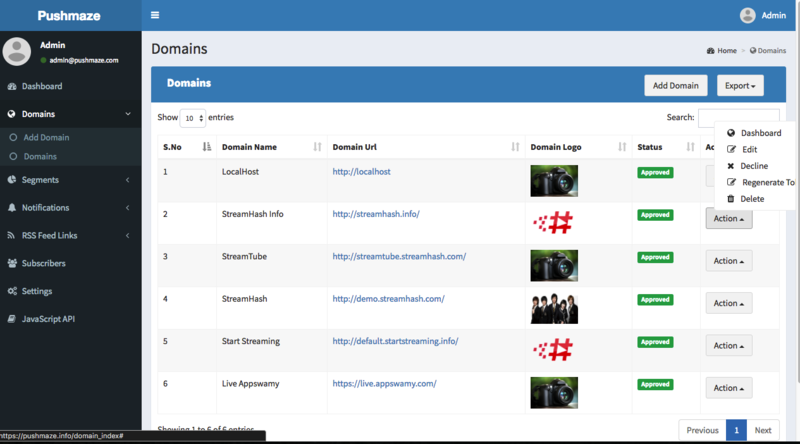 Domain Dashboard– You can see the following details under domains section. How many notification has been sent till now for this domain? How many subscribers for this domain. How many RSS feed for this domain. If the domain is https – you can download the script file add it in your domain. By doing this – users will get native push notification prompt. If the domain is http – you will get the script code. Copy the entire code and paste it in domain header section. For http – you will custom pop-up for allow push notification. Once the user click allow then new window will open and ask for allow push notification or not (native). In graph you can see last 10 days subscribers count. Browser usage – How many chrome, firefox and opera users subscribed? Add Domain – Fill the details like name, url, description, and logo to add domains. 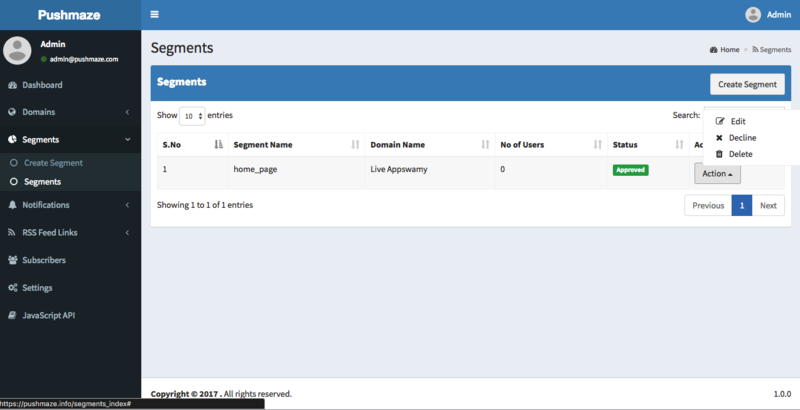 Add Segment – Fill the details – Select domain name, segment name and description to add segment. 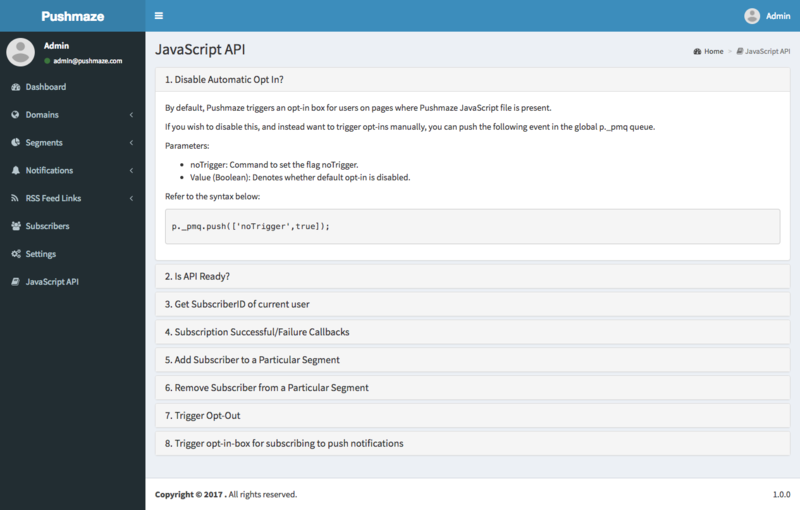 Once the segment name is entered you will get the jayascript code. Copy the code and paste it in your website where you want the differentiate the segment users. 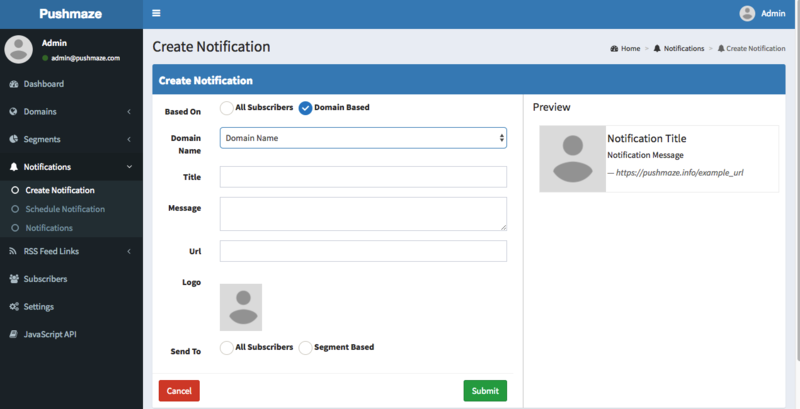 Segments – You can see the list of segments with basic information like segment name, domain name, number of user subscribed for the segment, status – Approved or declined and actions. Create Notification – You can create n number notification. All subscribers – Notification will sent to all the users who are subscribed. 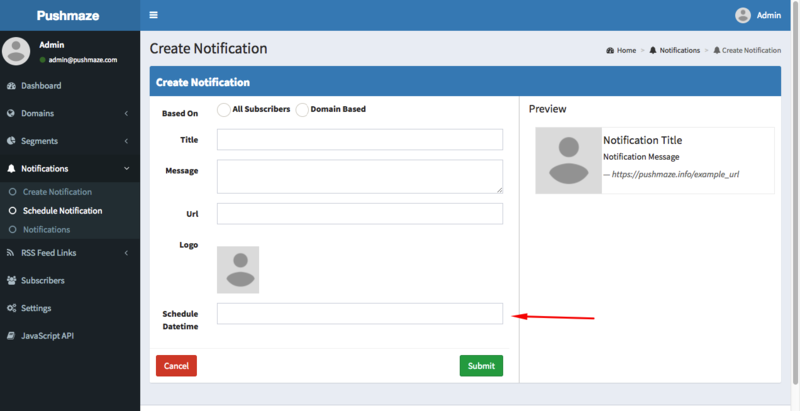 Domain based – Notification will sent to only to that domain users. Title, message content, url and image – you can see the change dynamically in the preview section. You will have other option send to : All subscribers or segment based. 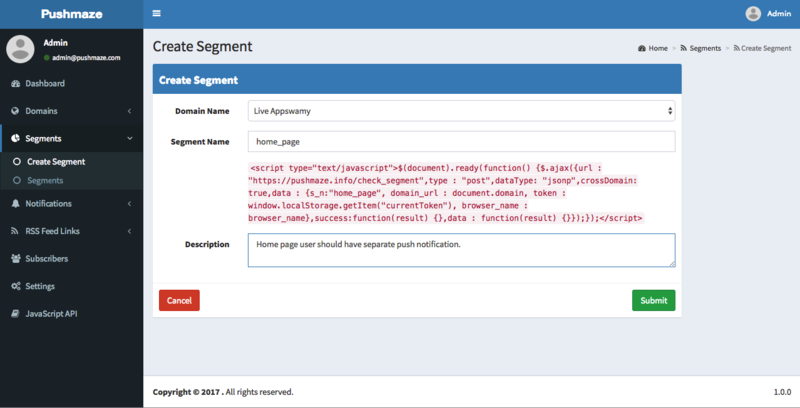 Segment based – Notification will sent to only any particular segment in the domain. Schedule Notification – This is same as normal push notification only difference is you can schedule datetime. So the push notification will automatically sent in the mentioned time. Notification details – List of notification with basic details – Title, logo, number of attempted, delivered, clicks, click rates, status and actions. View – Details about the notification details. Resend – you can resend the push notification by clicking resend. 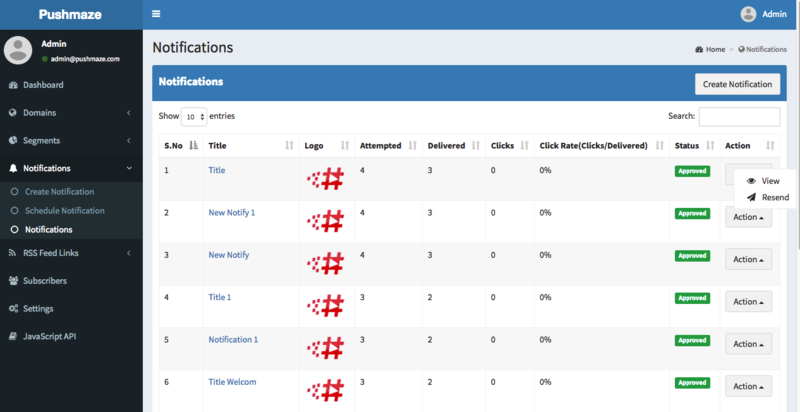 Single notification details – You can see the statistics here attempted, delivered, clicks and click rates. Total number of subscribers, with all other details like title,. 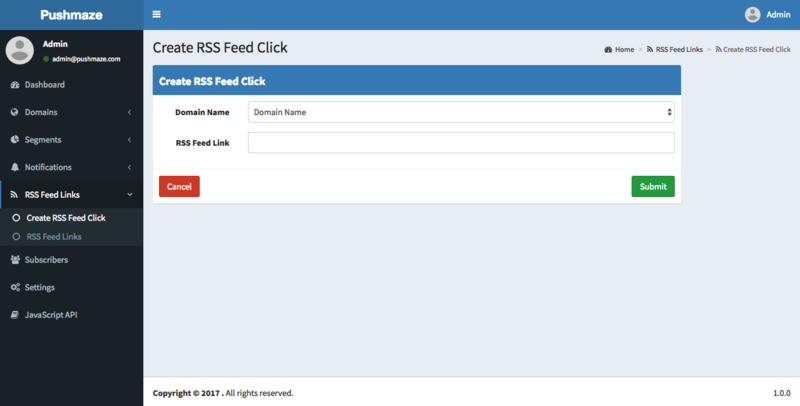 Create RSS feed – To create RSS feed link – Select domain name and enter RSS feed link. View RSS feed link – you can see the list of RSS feed with basic details domain name, Rss feed link, status – Approved or Declined and actions. 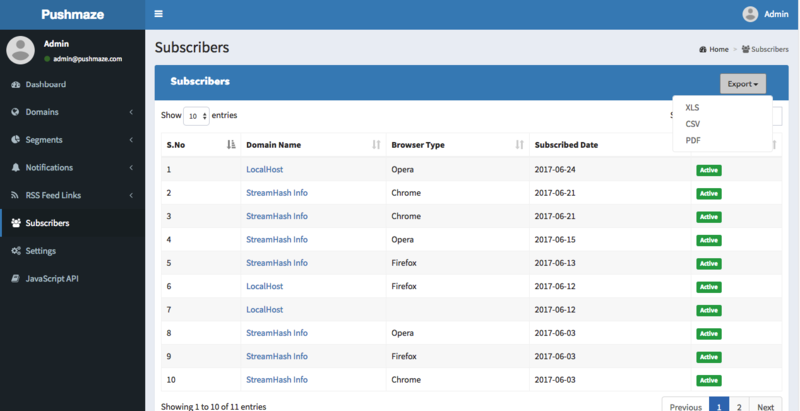 Subscribers – You can see list of subscribers with basic details domain name, browser type – Chrome, firefox and opera, Subscribed date and status – Active or inactive. You can also export all the subscribers details by clicking the export button. You can export into XLS, CSV, PDF. Settings – There will be 3 tab Site settings, Email settings, FCM settings. Site settings – You can change your site title, logo and favicon. 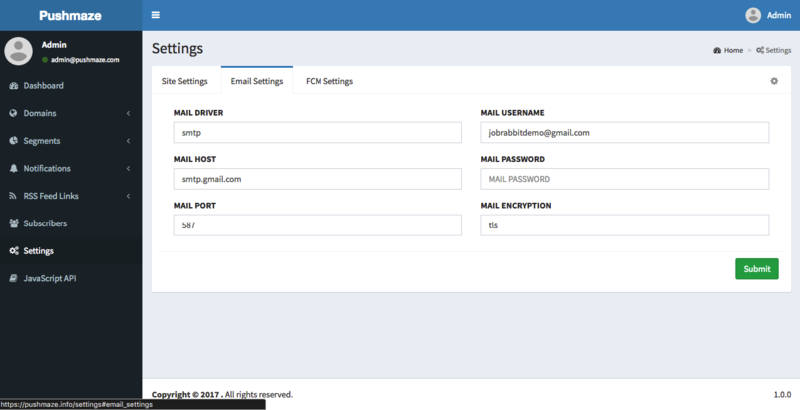 Email settings – you can change your SMTP settings anytime from here. 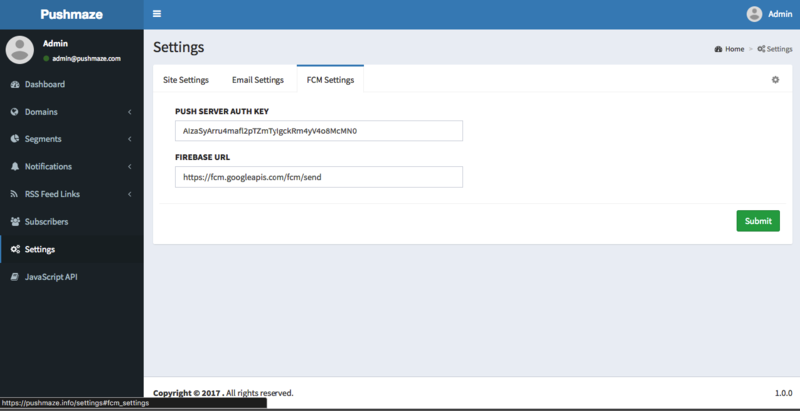 FCM settings – You can change you firebase server auth key from here and firebase URL. Normal you no need to change the Firebase URL, it is fixed until google changes the URL.